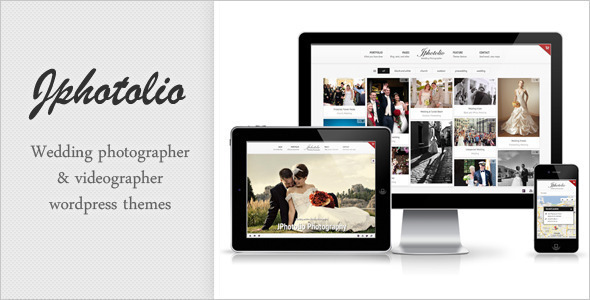 On version 4.0.0 We add New Black version of Jphotolio. It will fit for every photography need, such as Model Photography, Documentary Photography, and other photography need. This themes now included with music playlist that have feature you will hardly find on other themes. music playlist able to be played on entire website. And also it will stop when other music or video from content played. We hope this feature will bring new experience for your website visitor when visiting your website. 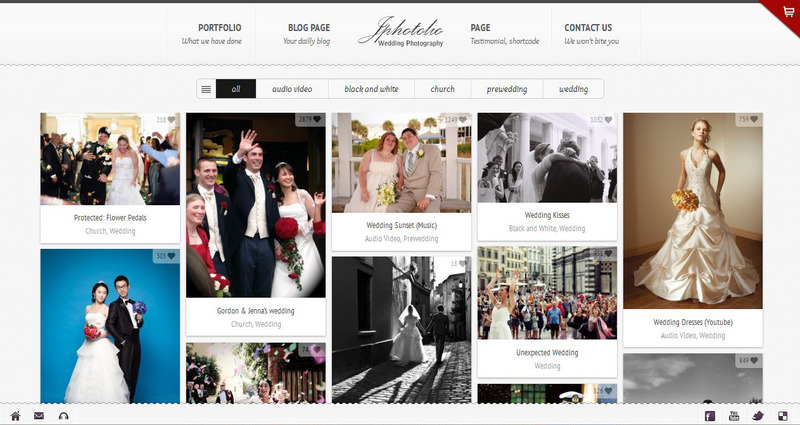 We build this themes mainly for photographer. You can discover usefull functionality for photographer. Password Protected Portfolio and Download Item Option is one of feature that you can use to deliver client work. Front slider not only for showing your best image. 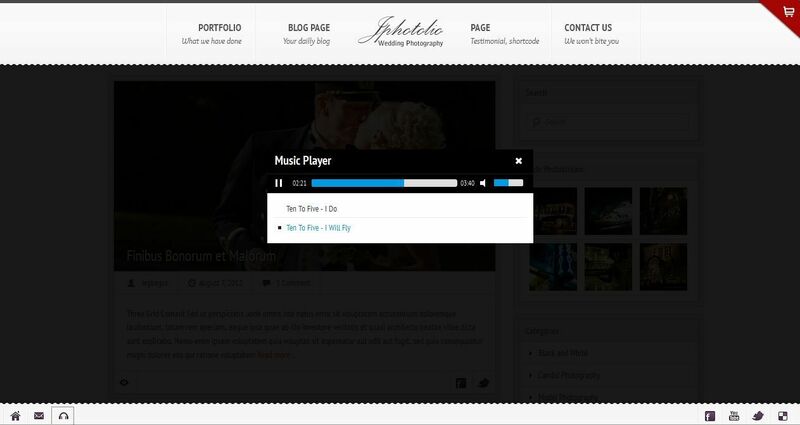 Its also support video, so if you wedding videographer, this themes is perfect for you with video support every page. We provide plenty option for changing style and option. You can change entire website style to match your personality. Never afraid to change style. We provide style manager so you will able to save your previous style. And you also able to create another style for different occasion with out affecting other style. This feature is very helpful if you want to change style regularly and revert back to other style instantly. If you don’t understand how translation work in wordpress, don’t worry! this themes provide you very easy translation. you can control all translation right from your admin themes option. This themes also very iOS friendly. We provide uploader for Touch Icon, so you can easily access your website right from your home screen. Swipe, pinching gesture also supported. We build very unique contact page. With Fullscreen google maps and integrated google direction, your visitor will easily get in touch with you. We believe this website is not only for showcasing your portfolio. By attracting your visitor with your portolio, you will need next arsenal to get client more confidence to hire you. Email notification is one of army to keep your client confidence to hire you. Your email notification will look more professional with HTML email notification. we also provide HTML email template that you can change as you will. You can easily manage setting of your website with this admin setting. Drag & Drop element, color picker, easy turn off option, and other option to easily your work. UNBELIEVABLE !!!!!!!!!! The most advanced and beautiful photography theme I have ever seen. GREAT JOB !!!! it is very tempting design and as the others said, beyond the normal photography theme. At last one of authors has made well theme for photographers! Sometime I thought – nobody knows here about how must looking and what must content the photosite. And now this theme looks very well – this is phototheme, exactly. WOW . This might be my new favorite theme. It’s ridiculous. THe Mapping is off the charts and support is great too. Aside from being one of the best looking photo theme around, the developer is one of the most responsive around. The theme has lot of styling and customisation features. This is awesome – normally skip over wedding photo themes but really glad I checked it out – some great attention to detail in the galleries and typography. I’ve bought many other themes who did not brought as many satisfaction as this one. Thanks ! fix facebook to share on portfolio, now it will pointing to portfolio item instead of portfolio page. give ability to support multi accordion on page & multi tab on a page. add new option for showing full image portfolio instead for croped one, so portfolio now able to show potrait image perfectly. add option to show location list first instead of contact form on contact page.